Death is a horrible thing to understand. There are reminders of what death will do always around us. Loved ones die and a void is left. Sadness fills our hearts to hear of the tragic deaths of those taken by the cruel hand of others. Wars fill the pages of the news. Natural catastrophes take large numbers of people in death. It can become overwhelming to consider the constant onslaught of death’s cold finger upon humanity. For most of the world, there are no answers. Grief is all they have. Hopelessness is how they face the reality of death. The joy of a child of God knows the Father has given an answer to death. It is not to be feared. Death is not a sadness that takes the joy from life. Death is understood because God’s Son experienced death but could not be held by it. The greatest tragedy of man was his rebellion in the Garden of Eden that brought about sin and death. The penalty of sin forced man out of the garden away from the tree of life. Adam lived 930 years but he died. Death was real. The man created from the dust of the ground to whom the Lord breathed into the breath of life died. It was not until Christ came to earth that death had an answer. Death no longer has the impact it once had. For the Christian death is only a sleep. The body will die but the spirit will live on because Jesus rose from the dead. God raised His Son from the pits of Hades and gave Him life and glory. Because of this powerful act of mercy and grace, the Father has promised to do the same for us. Death is but a moment that transcends the shackles of sin to give us glory in death. Just think – God will raise us up from death and give us glory. We will never cease to exist. Our spirits will not suffer the eternal pains of punishment. Our hope is built on nothing less than the promise of God to raise us from the dead. Life without hope is a life that is dead. 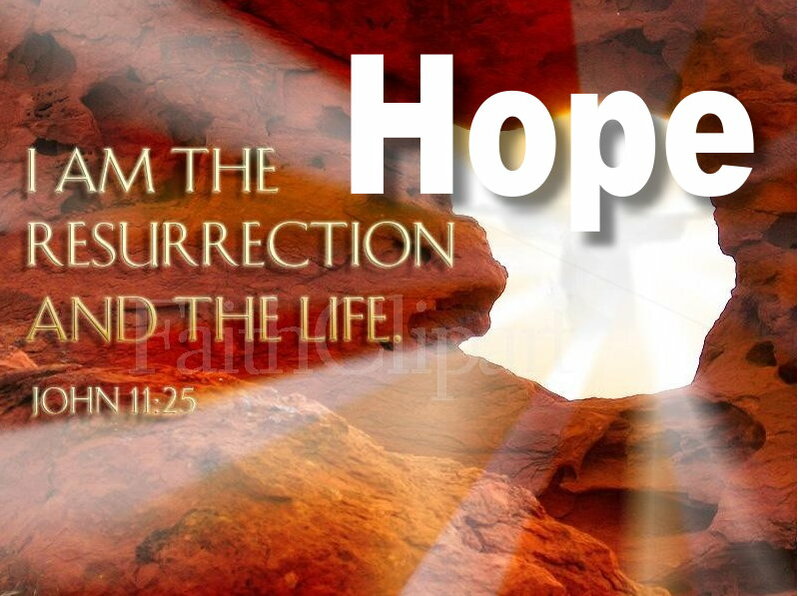 Hope is the well-spring of joy that takes us through the long days of trials looking earnestly for the promise of the resurrection. Living with the hope of tomorrow makes living today a day of redemption. Troubles may come upon us in the flesh but the joy of knowing that God will take away our tears fills our hearts with hope. There is brightness in the day when we see how the Father raised His son and gave Him glory. We will share in that resurrection and that glory. Resolve to fill your heart with the hope of resurrection. A glorious day is coming. Death will not have the final victory. Jesus has already removed its sting. Joy awaits us. Hope abounds. Lord Jesus come quickly.